Old school dog training told us that we should never play tug of war with our dogs, and if we did enter into such irresponsible games, never to let the dog ‘win’. As we learn more and more about what makes dogs ‘tick’, trainers have come to learn that games of tug can be a really valuable tool for training all sorts of different behaviours in our dogs. 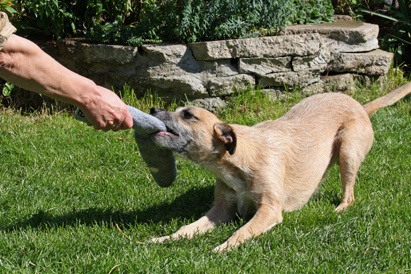 Dogs love playing tug, and it’s not all just about dominance. Watch a litter of puppies playing with various bits of cardboard, blankets and toys…….you can guarantee that at any one time a pair or pups will be playing tug, and although the stronger pup will usually win, it will often return to the pup who gave up the toy and invite it to play all over again. Playing tug is not only a great way to burn up energy; it is quite simply one of the best tools we can use to get our dogs to interact with us. When we play with our dogs we become the focus for all their energy and drive. Drive is what makes dogs chase, makes them grab hold of things, and ultimately what makes them chase and catch and sometimes kill their quarry. When we play with our dog correctly, we are teaching them that WE, the owner, are the most fun thing a dog can be around. Get the pup focused on YOU, and training becomes a whole lot easier, because you are working with the dog’s drive, rather than against it. How many people have tried to get a dog to come when it would rather be playing with another dog, or it becomes distracted by people in the distance. A lot of owners shout, plead, scream, and generally go over the top in a vain attempt to get the dog’s attention, all to no avail, because the dog has realised that an owner in melt-down is not the best place to be! Even if you don’t actually punish a dog for not coming the moment it is called, your bad vibes will be letting the dog know that you’re pretty wound up by its behaviour. NOW, take the dog which has been trained to see YOU as the best way of using its energy, and suddenly your whole world changes. The dog WANTS TO BE WITH YOU, because it has more fun with you than anywhere else, but this sort of focus doesn’t happen over night. And you may have to work hard to build that bond in the first place. Here’s where we use the dog’s drive to our own advantage: we’re using the dog’s natural energy in a way which means WE are the means of channelling that drive, that energy. Your dog, if properly trained in this way, comes to you because it knows that when it does, it can release all that pent up energy……..and we do this by playing tug. You might wonder what on earth this has to do with hunting dogs, after all, we don’t want to play tug of war with the rabbit your dog has just caught and retrieved to you! Don’t worry, this will not happen if you train your dog correctly. Training is something we do to get the dog working with us in the first place. I’ve trained a lot of my dogs by playing tug, and none of them have ever tried to play tug with a rabbit: ever! It all comes down to control, and conditioning; some people might even call it brain washing, I prefer to use the word ‘shaping’. We shape a behaviour in a dog through a number of carefully controlled steps, fixing each step of the behaviour, one at a time, before adding the next. So let’s take the retrieve: many people throw an object, tell the dog to run and fetch it, and expect the dog to return carrying the object. This might work very well with a lot of dogs, but it can also fail miserably if the dog decides to run off, and either chews the object, or just gallops about throwing it in the air. Cue red faced owner, steam coming from both ears, and totally helpless. Dog then realises, even if owner is buttoning up and keeping calm, (remember, dogs can read body language better than an ace psychiatrist!) that if it runs to fetch object, and doesn’t come straight back, owner gets mad, which of course then means that dog has no intention of coming back to owner carrying the object which has caused all that anger in the first place! NOW, if you start training a retrieve by letting the dog have a great time pulling and tugging on an object, WHILE YOU HOLD THAT OBJECT, we have already established the first step in that retrieve sequence. The dog is actually having a really great time holding something in its mouth, at the same time as being with you. It is using energy and drive whilst playing tug, and it is also seeing you as the source of that great time: what could be better! Once your dog is playing tug really well, you can tell the dog to ‘give’ then quickly throw the tug toy a few feet away, and your dog should come right back to you so it can continue the tug game with you: and you have your retrieve! Here are the rules for shaping the dog’s behaviour. For there must be rules, and the dog must understand these rules before you ever commence playing tug, or you can end up with a madly tugging dog with no ‘off’ button to press! The dog must give up the tug immediately when asked to do so. The tug must never be grabbed unless the owner has given the command to tug. Use a toy or tug specially reserved for this game. Put this item away when you have finished the game, and don’t allow constant access. It must remain out of sight and mind until you decide to play the game again. And lastly, the owner must always be in control of the game. There are several methods of establishing rules, the following are the ways I’ve found to work the best with lurchers. Firstly, you need to teach your pup or dog to ‘give’ on command. This might sound back to front, but by teaching the end of the behaviour first, you establish the correct sequence of events. There’s no point teaching a dog to tug or retrieve if it hasn’t learned to give up the article when it comes to you and is told to do so. Training the release before you do anything else makes it the strongest part of the behaviour pattern you are trying to establish. Some dogs are motivated more by food than others, whilst some will go wild at the prospect of having another item to chase or pull on. Assess your dog and find out which motivates him the most. For the foodie, use very tasty treats, and make them of the small, swallow-at-one-gulp variety. You don’t want to lose momentum waiting for the dog to finish chewing a large mouthful. Fingernail sized morsels of bacon or cooked meat are favourites. Use something special, and don’t use crumbly things like biscuits. You want the dog to swallow at one go without looking for crumbs on the ground. For the dog which is more interested in ‘killing’ the toy than food, use two tug items, which must be identical. I’ll go into this method later. You start by just saying “Yes!” and giving the dog a treat. Do it again, say “YES!” and give the treat. Do this as many times as you want, but most dogs learn very fast that when you say “Yes!” they are going to get the reward. At this stage the dog doesn’t have to do anything at all to earn the reward. All you are doing here is teaching the dog that “Yes!” means the dog gets a reward. Later on you will use the “Yes!” to let the dog know that it has done the right thing. Sounds complicated I know, but look at it from the dog’s point of view. You say “Yes!” and the dog gets a treat: it learns that “Yes!” means something good. Only say “Yes!” once. This is important for the word to retain its meaning as the marker, or cue. Once the dog has understood that “Yes!” means something good is going to happen you can introduce the tug. Show the dog the tug. Active, confident dogs will almost always reach forward and sniff what you have in your hand. Immediately the dog does this you say “Yes!”, and the dog knows it has done the right thing, then you reward with the treat. Now you up the game a little: you want the dog to actually grab hold of the tug, so you stop rewarding when it sniffs the tug. Depending on the dog, it could take a few seconds, or a few moments, or even longer, for the animal to actually reach out and grab the tug. Big “YESS!”, and a mega reward. Not just one titbit, but several. This lets the dog know that it has hit the jack pot in grabbing the tug. Next you can introduce the word “Give”. As the dog lets go of the tug to open its mouth for the treat you say “Give”. Not after the dog has spat out the tug, but right as it is doing so. Most dogs don’t take long to associate the word “Give” with letting go of the tug and receiving the reward. You have to fix the “Give” command before you start playing tug. “Give” is how you control the tug game. As the dog advances in its understanding of the game, it learns that giving up the tug isn’t the end of the fun, just a break in the game. Leave it at that for the moment, put the tug away and leave the dog to digest this new information. It is a fact that by stopping any form of training the moment you hit the right behaviour, the pupil digests and retains that information much better than if you have continued for ages where mistakes and wrong behaviour have more of a chance of creeping in. Once the dog has learned that grabbing the tug is the behaviour you want, put the tug away. Next day, start again. Say “Yes!” and offer the tug to the dog. The moment he grabs it reward with praise and titbits and offer verbal praise as well: “Good dog” or whatever phrase you want to use. The dog has now realised that it needs to grab hold of the tug to get the reward. This kind of training allows the dog to figure out, through trial and error, what you want it to do. The fact that the dog is making its own decisions, thinking about how to get the reward, means that it is learning much faster than if you are forcing a sequence of behaviours. Yes, you can train a dog to hold something in its mouth by opening its jaws, inserting an object and holding its mouth shut while you say “Hold”; but this type of learning is forced on the dog by you, the handler. Any type of forced training is necessarily a negative experience for the dog, as well as being open to abuse, and is very difficult to get right. Modern training is all about shaping natural behaviour in a way which benefits us without restricting or squashing the dog’s natural drive and enthusiasm. Dogs trained through play and reward will ALWAYS retrieve to you as they have learned that it feels good to do so. The fact that we have subtly conditioned this behaviour means that there has been no stress on the dog, only pleasure, thus fixing the behaviour all the better. Once the dog is grabbing the toy with real enthusiasm you can start to tug. Small pups need gentle, very gentle, pressure on the toy. No sharp jerking movements on your part. Remember you should be sitting on the ground for pups and small dogs: you must not put them in a position where their heads are forced upwards unnaturally, especially with young puppies. Sitting on the ground also has the effect of keeping things low key and calm; essential in the early stages where you’re both learning the game. Drag the toy around you, not too fast. Low drive dogs, or those which aren’t confident playing close contact games like this need very gentle handling at this stage. Any sudden move, or a loud voice, may put them off. Praise in a low, encouraging voice, and if you see that your voice is putting the dog off, keep quiet! Keep it to “Good dog” occasionally. Don’t do too much to begin with, just a seconds, certainly less than a minute. When you want the game to stop, say “Give” , offering the reward with your free hand, and reward the moment the dog lets go of the toy. High drive dogs need little encouragement to grab hold of an object waved in front of their noses, whilst less confident and driven animals may need you to make the tug ‘move’ around on the ground like prey, to incite their interest. There is a huge difference between Bull breeds (for example) and sighthounds. Sighthounds are far less inclined to grab hold of something which is stationary, whereas Bull breeds and other ‘grabby’, holding type dogs are more willing to latch on to something which is inanimate. Next week I’ll explain how to work with dogs which are either too motivated by food, to the extent that the food is of more interest to them than the toy, and those which are more motivated by moving objects. In the last article I explained how to start playing tug with your dog. 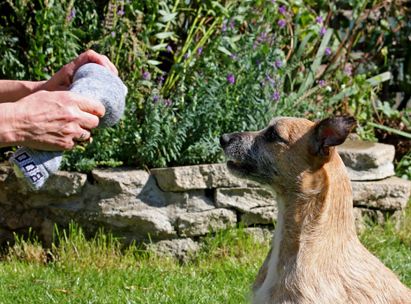 Whilst the treat method works with many dogs, very food orientated animals may find the food reward overwhelms the tug toy, to the extent that the dog becomes fixated on the food and will not engage with the tug, or those which are less confident, and need a moving target on which to focus their attention. With these dogs, we need two tug toys, both identical. To start off with I use an old, thick sock, into which I stuff a firmly rolled up old towel. I tie the sock off at the open end to stop the towel falling out. I make up two of these tugs. If you get serious about playing tug with your dog then you’ll need either a purpose made tug toy, which is made of much stronger material, often leather, and with handles at either end. However, the sock and towel toy works fine to begin with, just don’t expect materials to last very long! Using a food treat may be OK to begin with if it gets your dog’s interest, but the food will be faded out as a reward, because the dog is getting its reward by actually playing tug with you. I’ve only once used the food method of getting the dog to let go of the tug, and I found it much easier to get the dog focused on the tug by wiggling it around on the ground. This is probably because I’ve trained all my pups to chase bits of fur on a piece of string around the garden from an early age; they were already well motivated to chase something that moves. If you have always taught your dog to give up anything it is carrying as soon as you put your hand on the catch or article, don’t expect an instant understanding of this new idea of holding on and pulling back. In fact, some very submissive sighthound saturated dogs may find this an impossible concept unless you start them off as puppies. Now, how to get the dog to tug without food. You will, of course, have already taught the meaning of the marker word “Yes!””, as I described in the last article. The dog should now realise that “Yes!” means a reward, but when training the dog which is overly food orientated, we use two tug toys instead of one. You start by wiggling the tug toy, the old stuffed sock in my case, around on the ground in front of you. It helps to be sitting on the ground at this stage as you shouldn’t be looming over the dog: get down to dog level to encourage play and to lessen your dominance and status. Drag the sock around, make it stop and start, make it ‘run away’ from the dog. Never push it towards the dog, as you want to incite the predator/prey reflex. The prey (the sock) flees, and the predator (the dog) follows. It is canine instinct to chase or follow what is moving in front of it. 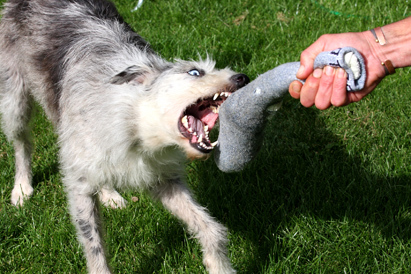 If the dog appears disinterested in the sock, remember, if you haven’t played games together before, the dog may actually be scared of getting up close to you in play mode. That should tell you a fair bit about the way your dog sees you! Many working dog folk have grown up with the notion that you should never play with a working dog: what a load of rubbish! Play forms better bonds with pack mates than any number of sit-stay-do-as-I-say lessons, and whilst you want a dog which obeys you, you shouldn’t want an overly submissive dog which is scared to think for itself. I can honestly say that my training methods have improved dramatically since I got my Airedale. This amazing dog actually taught ME the basics of engagement play and training! Whilst I have always used the tug training with unconfident dogs, I hadn’t understood just how powerful a tool this could be for ALL dogs. 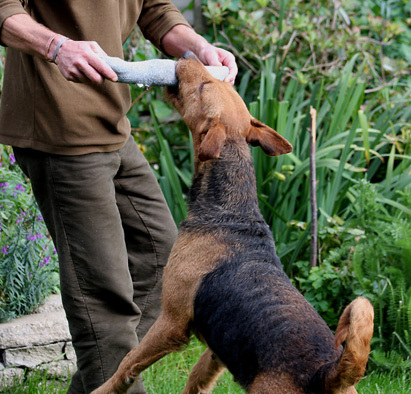 Dill, the Airedale, taught me how to play tug, reawakened my desire to really engage with my dogs, and this enabled me to get a better relationship with even my older dogs. 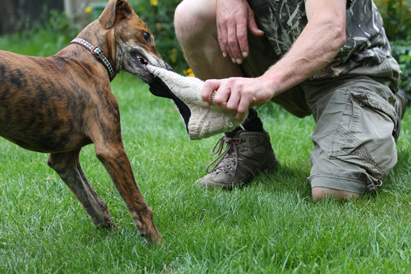 Back to the tug training: once your dog is grabbing on to and pulling the sock, you need to have the other sock ready to get the dog to drop the first sock on command. Let your hand fall to the ground, still holding the sock. Keep the sock still. Then, with the other hand, start wiggling the second sock around on the floor. As the dog leaves the first, now boring and immobile sock, say “Give!” right as the dog is letting go of the first sock. Immediately say “Yes!” as the dog goes for the second sock. Timing is important! Then “Good dog” as the dog pulls on the second sock. It doesn’t take long before the dog will reliably let go of the first sock on command, because it knows it is going to continue playing with the second sock. At this stage, don’t ever let go of your tug toys. The dog must realise that it can only have fun with these toys whilst playing with you. If the dog moves its mouth to bite your hand, say “Give” very sharply, turn away, and stop playing……….only for a few seconds, during which you ignore the dog completely. Dogs may grab at the hand by accident, but it can also be a ploy to get the toy from you. Don’t let this happen. The dog MUST abide by the rules. Give it a minute, at most, then re-engage the dog in play. This is how dogs play with each other as well, and there are very strict codes of conduct in canine play. A dog which doesn’t abide by the rules is cold shouldered by its mates, they yelp or snap, and turn away as if to say: ‘if you don’t play fair then I’m not playing’. This is something which dogs understand very well indeed, and you need to follow the same strict codes of conduct when you’re playing with your dog. You end the game by standing up, having commanded the dog to “Give”, and walk away, putting the tug toys out of sight. I use the word “Enough” as I stand up and walk away. They learn very fast that this signals the end of the game. Even if the dog is leaping round you begging for more, just ignore it. Once again, you are reinforcing the fact that you are in control of the situation. You can start playing tug with very young puppies, and in the initial stages you do nothing more than sit on the ground and offer the pup an old sock or other soft item to play with. All you are doing at this stage is getting the pup to bond with you through play, and you are not trying to put word commands into the game at all with pups that are under 4 months of age. The reason you must sit on the ground is partly to get down to the pup’s level to make yourself more approachable, and partly because at no time must you force the pup’s head upwards, which can damage its spine. You must only tug as hard as the pup tugs, though many small puppies don’t actually tug; they just run around you, back and forth, mouthing the toy whilst you hang on to one end. It is important not to let the tug toy go at any stage. This is your toy, and you’re sharing it with the pup just for the duration of the game. The game must be played by your rules, so if the pup nips your hand you squeak sharply as though in pain, gently but firmly remove the item from the pup’s mouth and put it out of sight for a few seconds. Then offer the tug again. Try not to speak too much to the pup whilst it is tugging; you don’t want to distract it, and some pups react to your voice by letting go of the item and scrambling up at your face. Each pup is different however, and you should be guided by the way your pup responds to both your voice and the tug toy. Some pups get much too excited and words of praise can incite them to go even further over the top. If this is the case, keep the whole game very low key and remain silent whilst the pup tugs. Only play the game for a couple of minutes at a time to begin with, for tugging is very tiring for young mouths and bodies. One a puppy has started to understand spoken commands you can introduce words such as ‘take it’ or ‘yes’. I usually start a session by showing the pup the tug item, choosing a moment when the pup is neither tired, nor hungry nor distracted by something else. I then sit in front of the pup and say ‘yes’. This is my trigger word; the command which lets the pup know it has my permission to grab hold of the tug and start playing. When I first introduce this word I am standing up, towering over the pup, with the tug toy well out of its reach and sight. Having called the pup to me by saying its name, and having got its attention, I then sit down in front of the pup at the same time as holding the tug toy out in front of me, saying ‘yes’ in an excited tone of voice. To begin with the pup doesn’t know that the ‘yes’ command means anything at all, but by associating the presence of the tug toy with the offering and the word, it learns that the ‘yes’ means that the pup can start play. Now for the release command. I need to teach the pup that giving up the tug is only a tiny break in the game, and not the end of its fun. This is an important part of learning self control, and something that is invaluable in the training of any dog, but vital in a working dog that will eventually learn to give up its catch without feeling deprived of its possession. I use the word ‘give’, as it is the command I shall eventually use in the field when the dog brings me a rabbit. ‘Give’ means letting go of whatever the dog has in its mouth when I tell it to do so. If you teach the ‘give’ during tug play you’ll never have a dog that wants to hang on to its catch, for it has learned that to give up something means no more than momentary loss, with much more fun to be had just seconds later. When I first started tug training I used food as a reward for the ‘give’, tempting the dog to give up the tug toy by distracting it with food. This is something I found unproductive for the working dog, for many lurchers are quite immune to food when they are in hunting mode, so I now use a second tug toy as the distraction instead. Whilst the pup is tugging away merrily I reach with my free hand to the second old sock or woolly hat that I’ve tucked into the back pocket of my jeans. I produce this toy and wiggle it about furiously on the ground, at the same time as letting my other hand which is playing tug with the pup, go slack. I don’t let go of that toy, but I make it seem ‘dead’ and uninteresting, which immediately directs the pup’s attention on to the ‘live’ toy that is moving about slightly to one side of me. The pup lets go of the first ‘dead’ toy when its attention is moved to the now more exciting second toy that is wriggling about. At the exact moment the pup lets go of the first I say ‘give’. Timing is important, as is tone of voice. I use quite a sharp tone of voice here, and as the pup moves to grab the new toy I say ‘yes’ in the excited voice which is the trigger word for allowing the pup to grab hold of the item. It may take you some practice to get the timing and the commands right, and with exactly the right timing. We don’t want to teach the pup to grab when we say ‘give’. Although this might sound completely bonkers, practicing with another person can often help you get the timing right whilst you learn how to give the commands. Get a friend to act the part of the puppy, and hope that your friends are as nutty as you are! I reckon that a pup of around 6 months, providing that we’ve already established a good bond, and the pup is confidant around me, can learn the whole concept of ‘yes’ and ‘give’ in a single session lasting no more than 15 minutes. The exciting thing about using a pup’s drive and energy to teach it new words and concepts is that all dogs learn much faster when they are in a driven mode; when their energy is positively engaged, rather than the dog simply feeling that is must submit to orders with no reward. Next time: the retrieve itself and why tug play works. As I’ve no doubt said in the past, retrieving, or rather, the refusal to retrieve can sometimes be the biggest stumbling block in the lurcher owner’s training programme. Over the years I’ve made countless mistakes when training my dogs, and sometimes I’ve learned nothing at all! You learn nothing when everything goes according to plan. If you have a pup which happily runs and fetches a ball and brings it back to you for a repeat performance, you don’t have to think laterally in order to get that pup to do what you want because it’s all happening naturally. The problems arise when the dog doesn’t bring back what you want it to fetch, and finding the reasons behind such a refusal is what led me to tug training. I expect we’ve all seen the pup which bounds gleefully after a tennis ball or toy, then runs off with the item, playfully taunting its owner by coming oh so close, before racing off again. These pups are trying to ‘run’ the game themselves. At the risk of incurring the wrath of pun haters, they aren’t playing ball: sorry about that! I actually like a pup which shows these traits. Dogs which possess that initiative, wit and the sharp intelligence which can reduce their owners to little blobs of steaming rage are actually very good for us humans. They force us to rethink our old and possibly outmoded training attitudes. And they make us better trainers in the long run. The pup which runs around with the ball, maybe throwing it up in the air, dropping it and chasing it all over again, without any intervention from you, is really telling you that it is too damn boring just playing the ‘fetch and retrieve’ game. 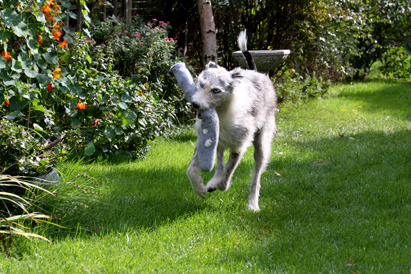 We NEED our lurchers to have initiative, brains and sharp reflexes. It’s exactly those traits which will ultimately create the better worker in the field. How we react to those traits whilst training will therefore determine how our dog sees us in the field: as a friend, part of the team…….or foe, someone to be distrusted and avoided because the dog knows that its drive and needs have not been understood. It’s all about drive, need and energy. If we can show the dog, prove to that young pup, that we understand what makes it tick, what forces it to run, chase, grab and play, then we shall have an ally in the field. If we can’t understand the dog, don’t understand how it feels, can’t see how the predator needs to play, it shuts down, turns away from us because we are no more than the person on the end of the lead, the person who feeds and exercises the dog. If we want our dogs to retrieve what they catch, they need to feel very comfortable when they are near us, and not just comfortable whilst they are lounging around at home, but when they are in that different place, the place where predators hunt and kill. That place is present in all our dogs, no matter how gentle and affectionate they may be with friends and family, be they canine or human. 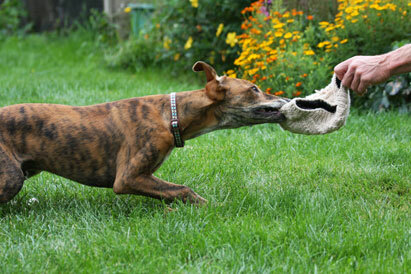 Tug games encourage the dog to be that predator, that killer, that grabber and shaker when they are right by our sides. When you see the glint and steel in the eyes of your gentle lurcher as it tugs and shakes the toy in your hand, you know that you are sharing that place with your dog. This sharing, the feeling comfortable whilst in that hard driving zone, is what will allow your dog to bring you back the rabbit it has caught. Dogs which feel proud and happy to be with their owners whilst in the driven, predator zone, actually WANT to retrieve what they have caught. They want to be near you with their prize because they have learned, through the tug games that it feels good to be with you, near you, no matter what they are holding in their jaws. Of course, there are plenty of lurchers who retrieve happily to their owners out in the field, with no tug training at all. But I’ll hazard a guess and say that most of those dogs will have owners who take the time to play with their pups, get down and dirty in rough and tumbles with their little predators. These owners make being close to the human the best place to be, no matter what the game. So, once your dog is playing tug well, give the release command, and quickly throw the tug toy, only a couple of yards. I can guarantee that your dog, if it has learned the game correctly, and knows it can release all that drive and energy whilst in contact with you, will pounce on the toy and bring it straight back to you for more tugging. I’ve recently done this with adult dogs which had never played tug in their lives before, namely Cricket, the Whirrier, and Sparrow, the little merle lurcher, who I had such trouble with when training the retrieve when she was a pup. Because she wasn’t timid or shy, I just didn’t think to play the tug game with her. Oh ye of little brain! Me, that is! Fiery Collie brain with a dash of Saluki she has, and plain old retrieving things that I’d thrown just shut her down and bored her rigid. She has a strong play mode, but I’d neglected to use enough play in her initial training: yes, even at my age I’m still learning stuff, and Sparrow is now 8 years old, so 8 years ago I hadn’t learned what a powerful tool tug play can be. But put in that tug play at the end of every retrieve, and she’s running back to me desperate for more … funnily enough, she’d always retrieved her rabbits just fine, and her recall was good, so I hadn’t needed to teach her to tug in order to get a retrieve or come back to me, but playing tug has certainly improved our bond tremendously.